You're trudging down a busy sidewalk, minding your own business, when suddenly the sky is torn apart by lightning, cars and lampposts are hurled across the street by the wind, and a tornado starts heading your way. If you're guessing it's only an ad—you're right. 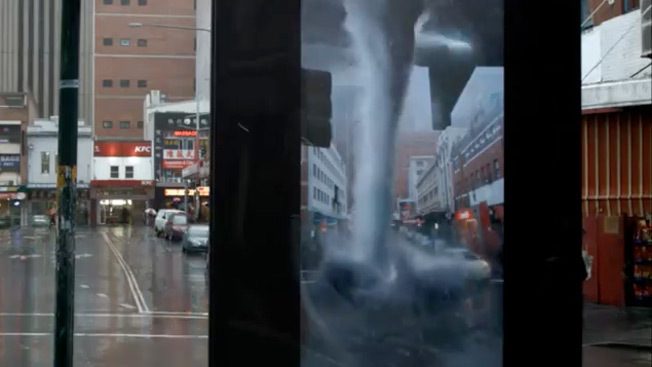 Augmented reality shop Grand Visual created the stunt in Sydney, Australia, to promote a tornado-themed disaster film called Into the Storm. A typical movie-poster street display was replaced with a large, high-definition video screen. The monitor initially shows the "poster" getting blown away by rising gusts. This seems to provide a clear view of the street being thoroughly destroyed by insanely violent weather. The visuals are impressive, especially the car appearing to slam into the display and smash the screen. And actually, this stunt—by the same team that devised PepsiMAX's apocalyptic bus shelter prank in London—seems more fun and enthralling, and far less unsettling, than some campaigns in the category. Sure, some of the passersby look a bit stunned at times. But they're probably just perturbed that we're all living in a world that's morphing into one gigantic ad.